We haven't written much because we've been having fun. We visited the Big Island, Molokini, parts of Maui and now we are anchored in Molokai! It's been hot with the temperatures near 90 and there's no sign of fall approaching, much less winter. 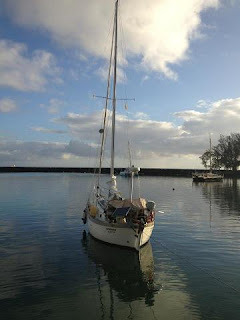 The trades are expected to pickup this week so we might be here for a while waiting for a window to get to Oahu, but that's ok because the anchorage is calm and we aren't in a hurry to start working on the boat and rushing around the big city of Honolulu just yet. The Frog King, the Fishing Lady and many others will be missed but NOT the ice machine. Our past couple of months inside the Wailoa Harbor (which is really just a tiny boat basin) hasn't been dull. When your boat is parked curb-side and open to the public 24/7 you get to meet everyone. Really the only downside with this very public spot is the ice machine that is about 50 feet from our bow that dumps out about 100 pounds of ice every hour and has a motor that won't quit along with a work crew that starts around 3am with lots of shouting and music. Other than that it has been interesting seeing the world go by and floating in what amounts to a fresh water river that keeps the bottom of our boat super clean. We've enjoyed our time here on the Big Island but it is time for us to sail on to Maui and the other islands. Friends are going to ship our car to us on Oahu once we get there so we'll have transportation again which will be fun. We are both a bit anxious to get moving again. Three must be something wrong with us. Here's a parting shot of our boat in the basin with big-ol' Mauna Kea with its telescopes in the background. Awesome. UPDATE: Check out our guide to brewing beer on a boat. What do you get when you combine some starches, Hilo rain water and yeast? Vog Head IPA! Vog is volcanic fog and it drifts around the islands Volcanoes depending on the wind direction. It's toxic and can be quite a pest sometimes. Since we were using rain water we thought it might make a subtle difference to the beer. Ok, we also thought it makes a great name for a beer. Vog is a very unique feature to the Big Island of Hawai'i and even the WikiPedia page for Vog features Hilo. The past year or so we've been experimenting with brewing our own beer. We've learned a few things about it and how to do it best on the boat. Now we've refined our technique and upped the brew size to almost 4 gallons. In this picture you'll see our white fermentation bucket (food grade) with a spigot and a vapor lock. Then we have our 16qt. stainless pot for brewing. And since we are beer snobs, we have to have some fresh grains. We use a "mash extract" technique where we crack the grains (for best freshness) with the grinder you see on the stove, and then we soak them in a bag we made out of bridal vale material. We also use some dry and liquid malt extract just to make the ingredients more portable. Then we cooked it with the malt, grains and hops, which is a hot job in the tropics! This is our biggest batch of brown sugary stuff yet! Hard to believe that turns into beer, but add some bacteria and it does the work. It takes about 10 days to ferment in our warmer climate we can't keep it at the proper temperature so we have to be careful not to let it sit too long. We were a bit worried how our 4 gallons of bubbling beer would do during the tropical storm that came through, but fortunately we didn't get bounced around too much and the beer looks and smells good. When it's done fermenting it's time to break out the freshly sterilized bottles, bottle caps and priming sugar! Now the hardest part is letting them "bottle condition" for weeks. Agh! Some of the tricks we've worked on refining is using minimal water for sterilization and cleaning. We've also have a system the eliminates the need for a bottling bucket, siphon, and a second fermenter. It's a work in progress so we'll see how Vog Head turns out when the bottles are ready to be cracked open. I hope it's good! I've always been a big Astronomy fan and ever since playing around in the University Observatory many years ago I've wanted to see the best facility this side of our atmosphere for a long time. I wasn't dissappointed. On a rare clear day you can even see some of the large telescopes perched on top. From the visitors center at 9,000 feet we climbed a small hill to try to acclimated as we both felt the altitude. While it was pretty cool to drive up to 13,700 feet. It was even cooler to see the tools we as a species have built here just to look at the sky and search for answers. My personal favorite was the Submillimeter Array (see the photo with Sherrell and one of the big dishes). And I also liked the James Clerk Maxwell submillimeter telescope. We were going to sneak in on a tour that was looking at it, but we were spotted so we just stayed outside...bummer. In the cheesiest sort of ways seeing this massive investment in pure science research from countries all around the world gives me hope for the future. Learn about the 12 Observatories here or check out some live webcams of the mountain top. It's not so much the mountain top that is spectacular, but rather the things you can see from it. I'll leave you with one amazing image from Mauna Kea: Interacting Galaxies NGC474 (Canada-France-Hawaii Telescope). When we crossed from Mexico to Hawaii each evening we listened to other sailors checking into the long range radio network. At the top of the list (goes by longest number of days at sea to least number of days) was Jeanne Socrates on Nereida. She was doing a non-stop solo round the world sail (not her first attempt either). We listened as she sailed around New Zealand and started working her final leg back to Victoria, Canada. An amazing story in itself. But long after we arrived in Hawaii and during our time of climbing volcanoes and hiking jungles she has continued on day after day. Now she is less than 60 miles from the end and there is no wind. There's been little or no wind for some time on her leg home. Once she reported in 24 hours later that she had managed to go backwards. Now on about day 260 I decided to see how she's doing. She's in range of the US/Canada coastal AIS tracking system so you can see live updates of her position with her track history. I was surprised to see her still struggling to get home. Can you image the intense frustration to be able to see your destination yet, be going backwards? 260 days at sea. That's 6,240 hours of sailing. Compare that to your average 40 hour work week and that's almost 3 years of being "on the job". With only 60 miles to go you can bet she wants a vacation. Lava is hot. 2800 degrees F hot. Hot enough to glow. Hot enough to instantly evaporate sea water. And hot enough to remove your leg hairs when you stand too close to it. We hiked out across the black rock fields to a billowing cloud of steam and were amazed at the power pouring out from deep inside the Earth. And of course we did what any normal primate would do: we poked at it with sticks and stuff. I can't say we are enjoying Hilo. It just isn't enough. We love it here. There I said it. Will Hilo will say it back? These things can take time, I know. There are a lot of restrictions on boats and for people living on their boats in Hawaii which makes the politics of just hanging out here complicated. But with some luck we'll overcome them. So far only the politics have been the downside. Hilo has a lot going for it. It's a low key working town with few tourists. The weather is perfect for us: daily sun and rain. The mooring we are on is behind a protected breakwater and just off a pretty public park where we can land our dinghy. People paddle their kayaks and paddle boards by us everyday from the park where they also picnic and fish (often both at the same time). There are no less than 4 parks within a mile of us. We can walk down town and never have to worry about surf landings with the dinghy. Literately from the minute our feet first touched the soil people have gone out of their way to help us out. They've been AMAZINGLY friendly. After being here almost 7 weeks now I keep waiting to see the other side of the coin, but it's all good. If you're thinking it can't get any better -- it does. We bought a great little car and now we are hitting the hiking trails. We've hiked lava tubes, waterfalls, near very active lava craters, tropical rain forests, and taken tons of photos which we haven't even begun to sort through (sorry). We've been behind on our slog updates as internet is a bit patchy and we've been busy getting settled. We'll get some photos up soon. 6:30 am -- anchored in Hilo. Cat cleared all her rabis free requirements (no small or cheap task). Crew also rabis free and resting comfortably in calm water. I can't wait to see Sherrell tomorrow. Did we time that perfectly or what?